Okay... so I am fully into my African fiction now and am walking around like the cat that got the cream knowing that I always have something to look forward to, i.e the end of the day when I draw my curtains, turn on the lamps, get a hot drink (winter is coming good people ), and slump onto my couch with my latest book! Bliss!!!! 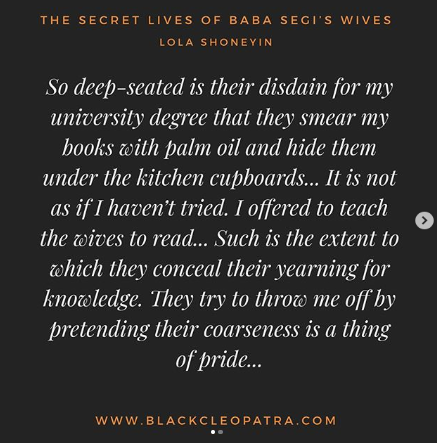 At the moment, that book is 'The Secret Lives of Baba Segi's wives', by Lola Shoneyin. This book has made me feel like I have just discovered the underground railroad to African literature and culture. It has connected me to people and places that I didn't even know existed, both in the real world and in my imagination. I now feel like part of a secret underground network and family of African literature lovers. The book was recommended to me by a Nigerian friend (Tite), who in turn had it recommended to her by her Nigerian friend (Naomi). 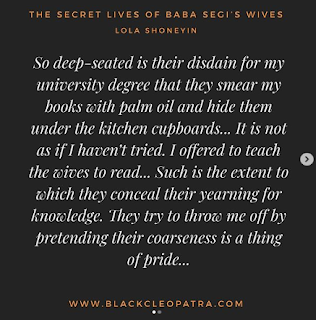 Both friend, and friend's friend, were born and raised in Nigeria and so books such as these were normal and perhaps readily available to them. Books like this and others such as 'Things Fall Apart' by Chinua Achebe and 'The Joys of Motherhood' by Buchi Emecheta where probably books that they had grown up with and (perhaps grudgingly) studied at school as young girls. However, for me, as a child of the diaspora, I grew up reading the likes of 'Tess of the D'Ubervilles' and 'Lord of the Flies' as study text in school - I still love these books. I had never heard of the likes of Chinua Achebe and Buchi Emecheta. 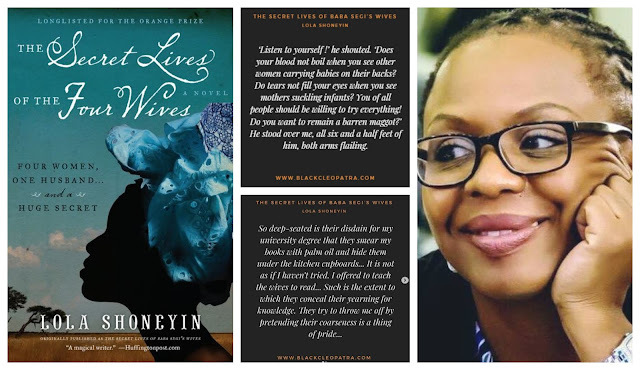 Perhaps if I had, their books, those of other African writers, and the beauty of African stories would have enriched me as a person and contributed to my life lessons growing up. I am now soaking up these books with such speed and relish... like I am making up for lost time. As Jasmine and Aladdin sang, it's 'a whole new world' for me now. I am so excited to learn about life, history, culture and tradition from the various African (and soon Caribbean/ and African American) perspectives. Whilst reading the story, I was trying to imagine the characters and how they looked and sounded. I imagined them with various features and mannerism of aunties and family members. The good, the plain wicked and the ugly! We all have these 'interesting' characters in our families. Especially if you are of African (specifically Nigerian descent). 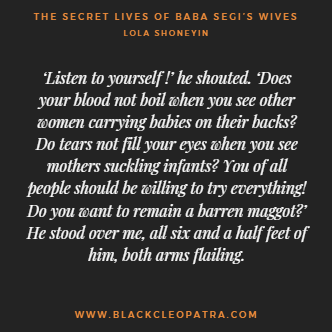 I imagined Iya Segi as a tall thick woman with a disapproving face, and a deep authoritarian voice. I imagined her with the corners of her lips perpetually turned down, head always held high whilst her eyes look down at rest of the world as a result of her 'position' as senior wife. 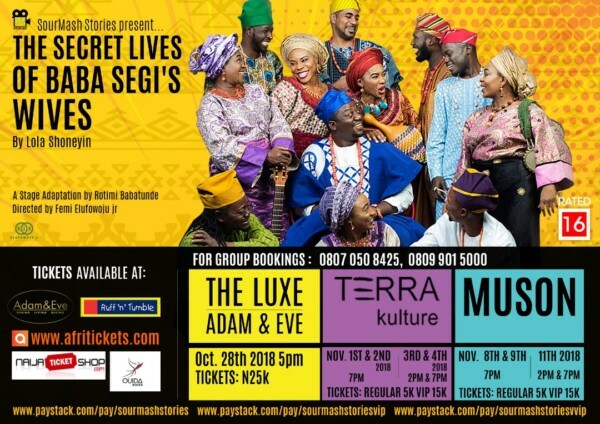 I imagined Iya Femi as attractive, but in a dark cruel way - a schemer for sure. 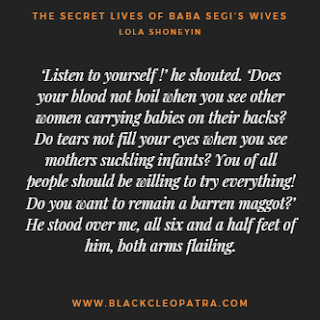 I imagined Iya Tope as small and simple, with a gentle demeanour and soft voice but as weak and disloyal. 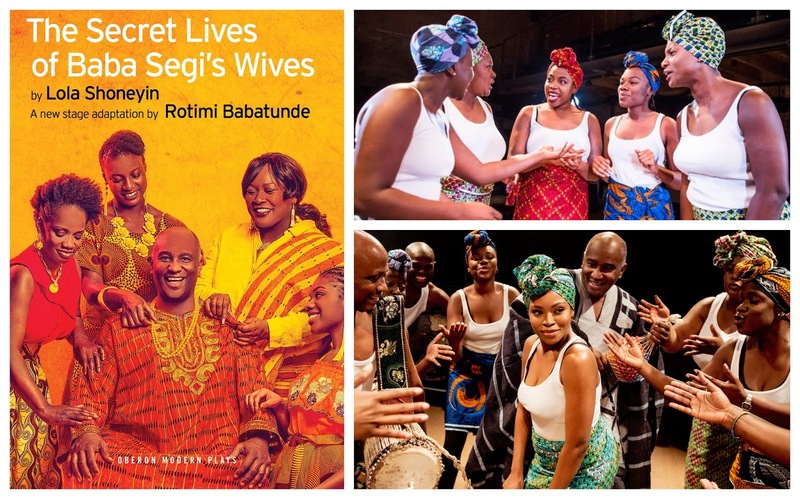 If you are one of the lucky ones who got to watch the stage adaption either here or in Nigeria... let me know your thoughts on it. As far as the book is concerned, I loved it. I gave it a 4/5 on Goodreads, (click HERE) where it has to date been rated 4,635 times with an average rating of 3.93. It has also been reviewed 725 as of today. It's worthwhile reading some of the interesting reviews - I added my two cents to the jar too. If you want to talk about this book or any other - I LOVE BOOKTALK!! - leave a comment below and will get back to you ASAP. Happy reading... and thanks for reading.